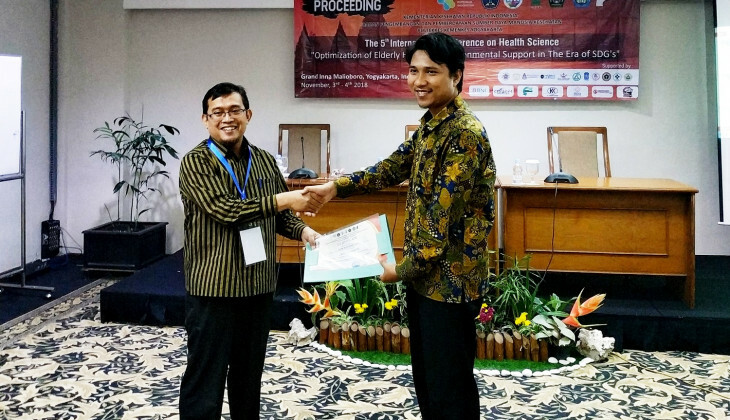 Lecturer of UGM Vocational School, Dian Budi Santoso, S.KM., M.P.H., has become Best Presenter in The 5th International Conference on Health Science (ICHS) in Inna Garuda Hotel Yogyakarta, held from 3-4 November. The international conference was organised by Poltekkes Kemenkes Yogyakarta in cooperation with Stikes Bali with 118 presenters participating. The international conference is an annual event to bring together researchers in health discipline to present scientific papers. Dian presented his paper titled Blockchain Technology Implementation on Health Data Management: a Review of Existing Studies. Dian wrote it in collaboration with Anis Fuad, DEA and dr. Ahmad Watsiq Maula (Faculty of Medicine, Public Health and Nursing UGM), and Guntur Budi Herwanto, S.Kom, M.Cs (Faculty of Mathematics and Natural Sciences UGM). As is known, blockchain technology means the technology that supports the operations of digital money like bitcoin. In his opinion, the use of blockchain technology was expected to guarantee security and personal data of patients. “Implementation in health areas is still new. The potential of this technology is very open to be applied in health areas, particularly in supporting the implementation of electronic medical records in Indonesia,” said Dian at UGM on Thursday (8/11). Furthermore, the acting secretary of Health Services and Information Department in the Vocational School expressed his appreciation over the award. He hoped this would motivate other researchers especially in medical records and health information to continue making innovation. “I hope there will be many blockchain researchers wanting to join to implement the blockchain technology in health areas in the country,” he said.